Recently, my wife was reflecting on what we miss while here in France. One surprising answer: good wine. 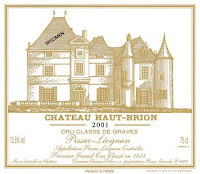 How is this possible in the land of Château Haut-Brion, Petrus, Puligny-Montrachet, and Château D’Yquem? Well, there is a strong tradition of localism in wine making. The locals support their neighbor vinters. Now if one happens to live where the regional wine is, let’s call it so-so, then a homogenized, mass-produced California product does not seem so bad. The surrounding area does have wines with an official “appellation.” In France, wine areas are granted an AOC, appellation d’origine contrôlée, as a way of setting a certain standard of quality. A suspicious outsider might also think that it serves as an effective marketing tool. To receive an AOC many conditions have to be met. Only certain grapes are allowed in certain areas, yield is controlled, as is sugar content, alcohol level, and the proportion of blended grape varieties. In most wine growing areas, even those producing inexpensive wines, AOC’s mean something. Typically, the more limited is the area covered by the appellation, the better the wine. Thus a label reading “appellation Beaujolais contrôlée” means that the grapes could be drawn from the entire Beaujolais. For “appellation Beaujolais Villages contrôlée,” the range is narrower. For more specific locales, the name Beaujolais may not appear at all, e.g. appellation Juliénas contrôlée or appellation Morgon contrôlée. Understanding the narrow versus wide range of appellations is important. A wine whose label reads “appellation Bordeaux contrôlée” might have very little in common with its more famous neighbors whose grapes are drawn from very specific locations. Around here, the wines fall within the appellation Ventoux contrôlée. Until last year, it was appellation côtes du Ventoux contrôlée but the shorter, more direct change was thought to identify better the area from which the grapes derive, an area dominated by Mt. Ventoux. Most of the area’s wines are red. The white grapes approved for carrying the appellation are not at all the ones associated with some of the fine whites made elsewhere in France. No Chardonnay, Semillion Blanc, or Chenin Blanc here. Rather the grapes carry less propitious names like Clairette and Bourboulenc, from which a less propitious product results. There is also a robust production of rosé. This last is a good thing because, as an easy drinking wine, rosé does not require the kinds of subtleties associated with whites or reds. 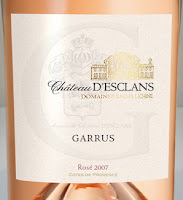 Rosés are also typically inexpensive, although a famous one, like Garrus, can sell for around 80 dollars. Provence in general tends to provide a large percentage of French rosés. Lately, the “industrial wine types,” always a worry for artisanal producers, managed to get provisional approval from the European Commission for a handy way of dumping surplus production: the sale of a wine that looks like rosé but is made by mixing white and red wine. A real rosé derives strictly from red grapes whose skins sit in the fermenting juice hardly at all. Mixing red and white wines thus provides a counterfeit. A final vote by the European Commission will take place April 27. If the French cannot prevail in getting a vote to forbid the mixing, they would at least like to mandate a label which would say “traditional Rosé” for those deserving the name as a result of production, not just appearance. Wanting to be loyal local supporters we regularly make our way to the village’s cave cooperative where wines from surrounding vineyards are fermented and bottled. We call it our “stop the developers” project. So long as vineyards remain profitable, then so long does the land remain safe from bulldozers and concrete. When there, we gravitate to the rosés. There is also a sweet apéritif wine that is quite successful. The whites are mostly hopeless. In a twist that indicates the kind of wines made here, the non AOC whites tend to be a bit better than the AOC’s. That’s probably because the vinters have more flexibility about grapes and procedures. A local sparkling wine also offers both a good taste and good bargain. For reds, we are still experimenting. So far, though, when we want a red to serve guests, we opt for the AOC just north of here the côtes du Rhône, an appellation that uses mostly the same grapes but whose terroir (soil composition, sunshine, drainage, elevation) makes all the difference. It’s not extremely local, but still way more local than Burgundy, Bordeaux, or California.